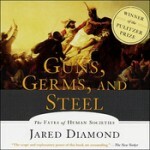 Finished “Guns, Steel, and Germs” by Jared Diamond. It attempted to explain why different parts of the world developed at different rates. He looks at various factors including the number of mammals in the area, the diversity of plants and the orientation of the continent (east/west compared with a more varied temperature of a north/south orientation). He viewed those factors as being more of a factor than issues such as religion, race or nature of the people. His book won a Pulitzer Prize.